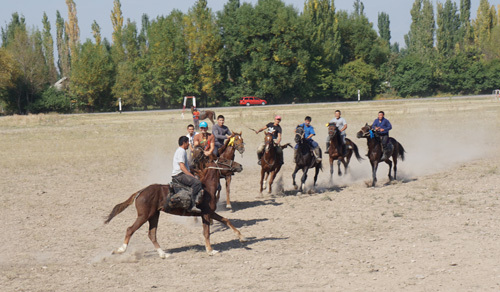 Seattle-based globetrotter Carol Willison travelled with Uzbek Journeys to Kyrgyzstan and Uzbekistan in autumn 2015. 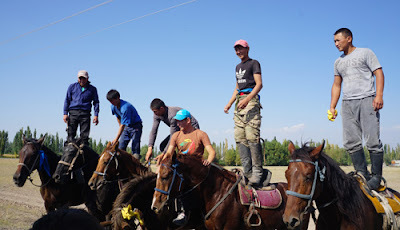 With fellow travellers, she watched a traditional horse game - ulak tartysh, also known as buzkashi - in the village of Don-Aryk, not far from Bishkek. This is her story about the match. I have lived with a sport enthusiast for the past 44 years and have watched just about every type of sporting event. I have seen balls of some type, either thrown, carried or hit into and over nets, across goals, into hoops, and rolled across greens. Some of these games are quick moving and action packed and some could put you to sleep. 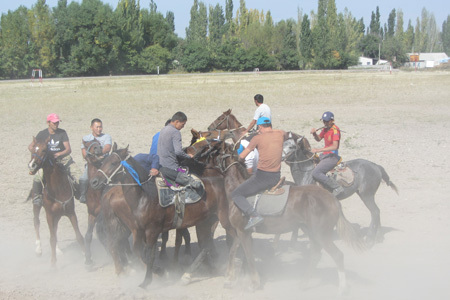 Last September, in Kyrgyztsan, I saw a sporting event I did not even know existed. It is called Ulak Tartysh or Buzkashi, which means literally "goat dragging". (In Uzbekistan it is called Kupkari). 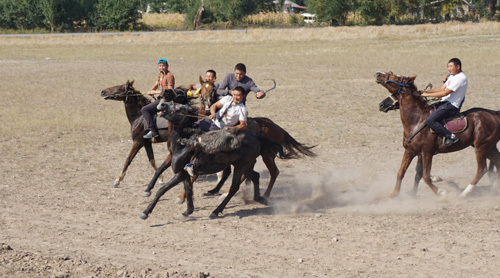 This sport is popular in most of Central Asia and involves players on horseback and a goat's carcass. The object of the game is to get the goat carcass across your goal, a bit like polo, minus the sticks, ball and British refinement. We were in Kyrgyzstan, in the small village of Don-Aryk in the Chon Kemin Valley, about 70 kilometers east of Bishkek. We went to a dirt field with small stands made of old tyres at either end - the goals. We sat on folding chairs on a bank above the field for better viewing. They have erected a portable tent to keep us out of the sun - very thoughtful and resourceful. We felt a bit like we are at Ascot, well sort of! The players lined up to present themselves before the game started, along with the referee. The players seemed so young and the horses were beautiful - well kept and obviously prized. They bowed to us and raced to the field. Then the carcass of a goat, minus the head, and sewn together at the neck, is tossed out onto the field and the game begins. The horsemen hang off their saddles, seemingly only by their legs, and sweep the goat off the ground and thunder off towards their goal. Everyone is in hot pursuit, either to defend him or to try to take the goat away. The most skilled players manage to hang on to the goat - not with their hands, but by wedging it between their leg and the horse, holding it there in a vice grip. This enables them to manoeuvre their horse with both hands and to fight off those trying to get the goat away. It seems to be a "no holds barred" type of game, in which players try to pull their opponents off their horses and dislodge the goat using just about any means they can. We yell, scream and cover our eyes while plumes of dust rise on the field. At times we hold our breath and the referee seems to be in as much danger as the players. In all of this confusion, the horses seem to know what is expected of them, and we realize that it would take a lot of training to make a horse a successful player in this game. Players seem to be more concerned about any injury to their horses than to themselves. After a hour or so the game comes to end with the victorious team getting the goat to the goal the most times. The players line up again, we all cheer and wave, the victors smiling broadly, and then they gallop off back to work. This was a midday break and fun, but it is only just that - they still need to get back to earning a living. We are all a bit dusty but exhilarated to have witnessed a unique local sport. There is a rumor that this was also a way to "tenderize" a goat before cooking, but I can't image that this could be true. The carcass is pretty mangled - Julia Childes would be appalled! Update December 2017: Ulak Tartysh (also known as Kok Boru) was inscribed in UNESCO's Representative List of the Intangible Cultural Heritage of Humanity.